At the end of February the amazing teaching assistants at Old Oak Primary School launched their pilot project Hungry Lions Club. Their mission is to feed hungry year six children breakfast in school before class starts. The club also engages the children to get to school on time, builds cohesiveness and improves class outcomes enabling all children to learn from the get go. 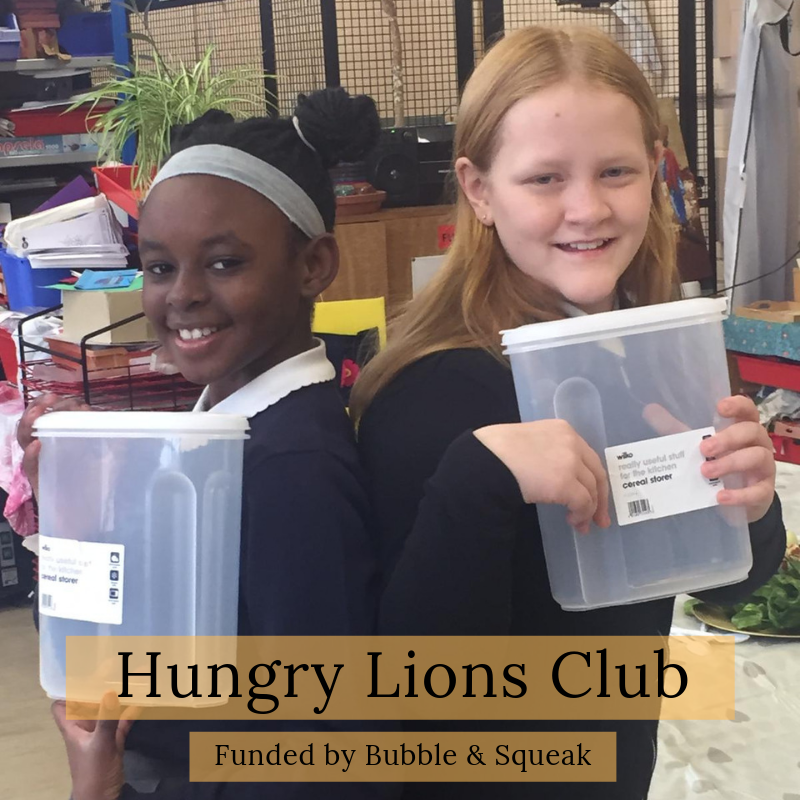 Bubble & Squeak are now supporting the project by providing surplus food and purchasing equipment for the club such as toasters and kettles using donations from our surplus food stall (yay circular economy!). On average the team serve 30 slices of toast a day and last week dished out 96 breakfasts! The pilot is running up until the end of May and we will keep you updated on its outcomes. Thinly slice sourdough bread. Then griddle in a little olive oil. Scrape a whole garlic glove over the bread to infuse with garlic. Serve the topping mixture on the warm sourdough bread and serve as a starter or mealtime snack. This February half the term we had another #teamworkisthedreamwork surplus food win with Old Oak Community Centre running their second successful Kitchen Social cooking club. With 25 families in attendance - using donated surplus food and support from Bubble & Squeak. The cooking session is generously supported by the Mayor For London Kitchen Social scheme. Their funding has enabled the Children’s Centre to buy valuable resources such as bowls, plates, cups, cutlery, serving spoons and baby beakers. Helping to kick started the project. During the session children made tasty pitta pizzas. Children did lots of cutting and tasting, choosing what they wanted to put on their flat bread pizzas and all sat at a table to enjoy the meal. They also took part in a crafty foodie activity cutting out fruit and vegetable pictures to put on their paper plates - talking about they likes and dislikes. All linked to the early years foundation stage framework. The session got great feedback from parents, with one saying it is “helping my child to eat better and to sit socially with others” and we should “do more of them!”. We also want to open this project up as a space for corporate volunteering to get involved with - so watch this space! As always with thanks to our surplus food partners City Harvest and the Felix Project for making this happen. The Children’s Centre next Kitchen Social will be taking place in Easter half term and open to all Hammersmith & Fulham parents / carers and their children under 7 years. Visit Old Oak Centre website for more info. On Monday our wonderful TA’s at Old Oak Primary School Fleur, Paula and Bethany launched Hungry Lions - Snack Attack! This initiative gives Year 6 an opportunity to have a healthy breakfast every day before the start of lessons. There are 54 year 6 children being fed Monday - Friday spread over two classes. Fleur, a teaching assistant for 15 years and born and bred in East Acton explains “We noticed a need as some children were going into class hungry and wouldn’t settle. Some were complaining they felt unwell and couldn’t concentrate”. The club launching right now is crucial as the children will sit there SATS in May and are at an important stage of finishing their Primary School education to the best of their abilities. An important aspect of the club involves both classes sitting together and sharing a meal. Encouraging class cohesiveness, learning good habits from each other and inclusivity are key life skills. The children sit down to place settings, table cloths and cutlery with an animal theme. Equipment for the club (such as the toasters) were purchased using donations taken from the Bubble & Squeak stall. The surplus food is being donated from Bubble & Squeak’s food partners City Harvest and Felix Project. It’s safe to say the club is a 'ROARING SUCCESS', with children getting the brains ready to start the day. The club is a 3 month pilot from now until May 2019. Please help us continue this club and consider donating to our pilot via our website link or donations can be dropped off to reception at Old Oak Primary School. £30 funds a club for 60 children per day. CLICK HERE TO DONATE. We are also looking for breakfast food donations such as cereals, porridge, honey, jam etc which can be dropped off to Old Oak Primary School directly. Our parent volunteer Ozen shares her recipe for a delicious winter warming soup using surplus veg from this weeks ‘pay as you feel’ food stall. 1) Peel and chop the vegetables. This week I used potato, carrots, onions and leeks from the surplus food stall. 2) Sauté the vegetables in a large pan with a little olive oil for around 5 minutes, add vegetable seasoning for flavour. 3) Add enough boiling water so the vegetables are covered. Put on a lid and simmer on a low heat for around 10-15 minutes. 4) Serve in a soup bowl with an optional squeeze of lemon to enhance the flavours. Season with salt and pepper to taste. Enjoy on its own or with some crusty bread. Since February 2017 Bubble & Squeak have been successfully running their surplus food stall for their parents in Old Oak Primary School every week during term time. Providing fresh healthy surplus food to children and their families via their food stall. Continuing to use the power of surplus food, enterprise and the wonderful creativity of our Bubble & Squeak children we have tried their hand at numerous things, including running pop-ups, exhibiting at Design Week, hosting intergenerational bingo for their grandparents and successfully running their own crowdfunding campaign for a shipping container to store more surplus food. All done using the space of a free local After School Club as a hub to plan and create. Behind the creative surface, we are building other ways to engage our local community using surplus food that would have gone to waste using close partnership work with well established organisations. Since the summer of 2018 we have been supplying Old Oak Community Centre with a box of surplus food to feed their Stay & Learn 0-7 years cooking session over the summer holiday. With the holiday club children at Old Oak Centre packing the boxes using donated surplus food from City Harvest and The Felix Project arriving on a Monday morning. The holiday cooking clubs in Stay & Learn were such a success Bubble & Squeak then signed them up for Mayor For London’s ‘Kitchen Social’ scheme to tackle holiday hunger. On top of this Stay & Learn have also now incorporated surplus food into their Snack Time during term time. With staff collecting a box of bread, fruit and vegetables for families to enjoy each week on a Monday morning. 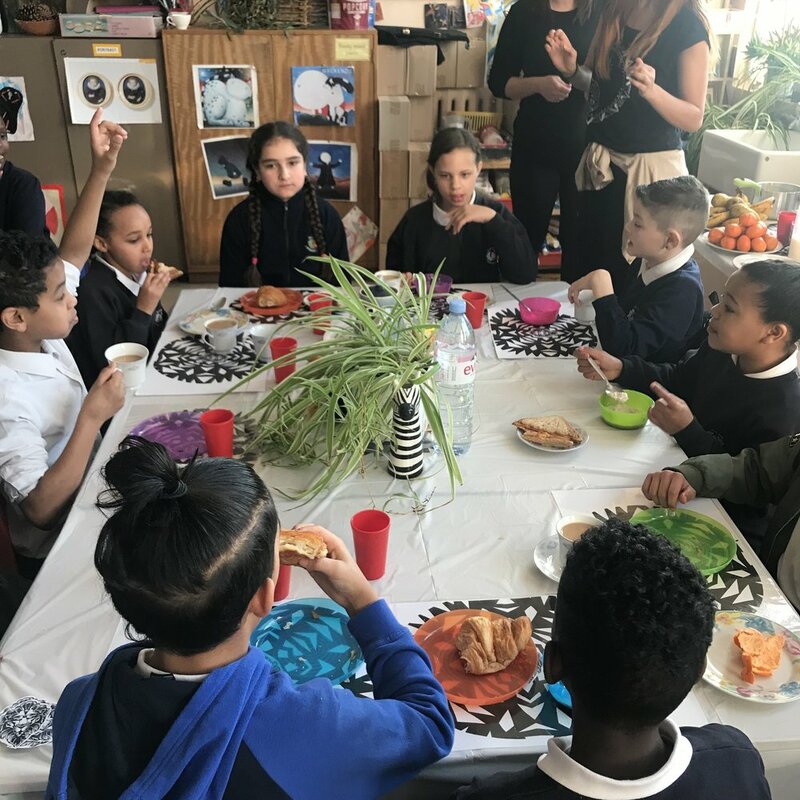 Chantel Gordan, Early years co-ordinator for Old Oak Children’s Centres says “the weekly outcomes for our children is brilliant, as not only are they eating healthy food, they are learning the building blocks for eating well, sitting up at a table and using cutlery in a social setting”. Parents agree with one saying “it is a great opportunity for children to have a meal together, to see how fruit or vegetables are cut. It encourages children to try new foods and I hope this scheme continues”. With thanks to our brilliant surplus food partners The Felix Project and City Harvest (who collect and distribute the surplus food) that make this work possible. We look forward to working with Mayor For London’s Kitchen Social too. 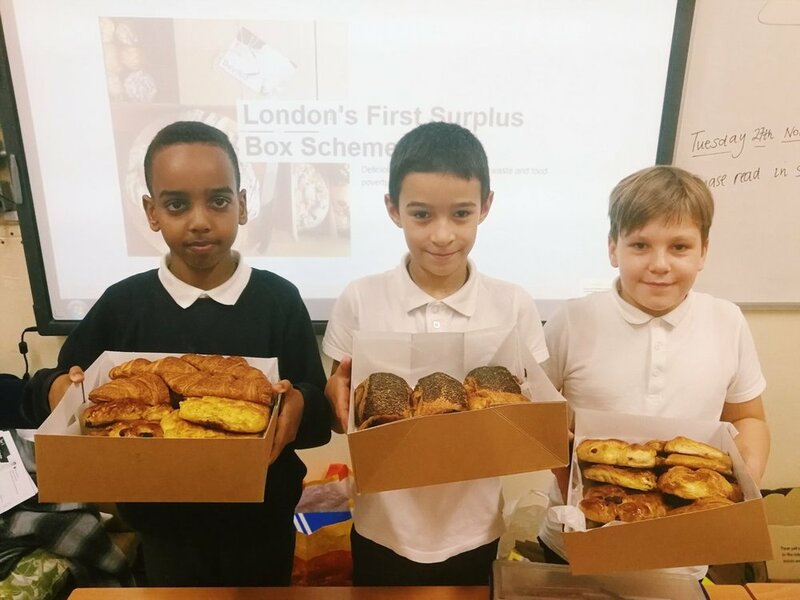 A few weeks ago we invited Jo from @dayoldeats to talk to our Bubble & Squeak children about her amazing social enterprise rescuing surplus bread and pastries for her subscription box scheme. 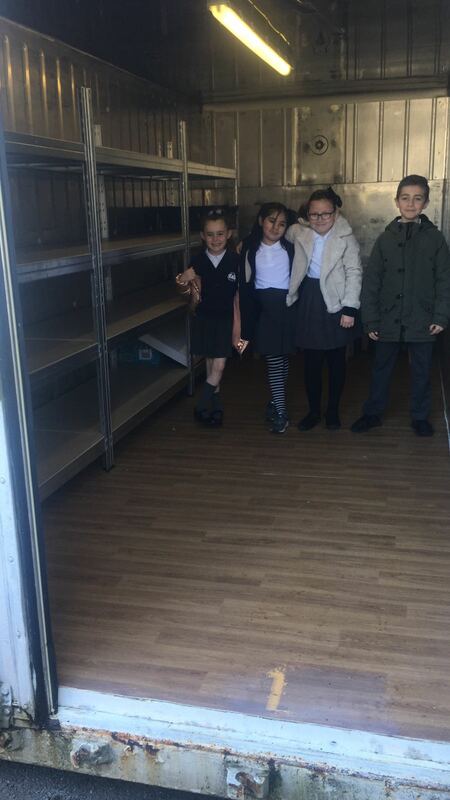 She said the children were 'incredibly knowledgeable about food waste & sustainability and their socent is making waves - I regained my hope for the future". 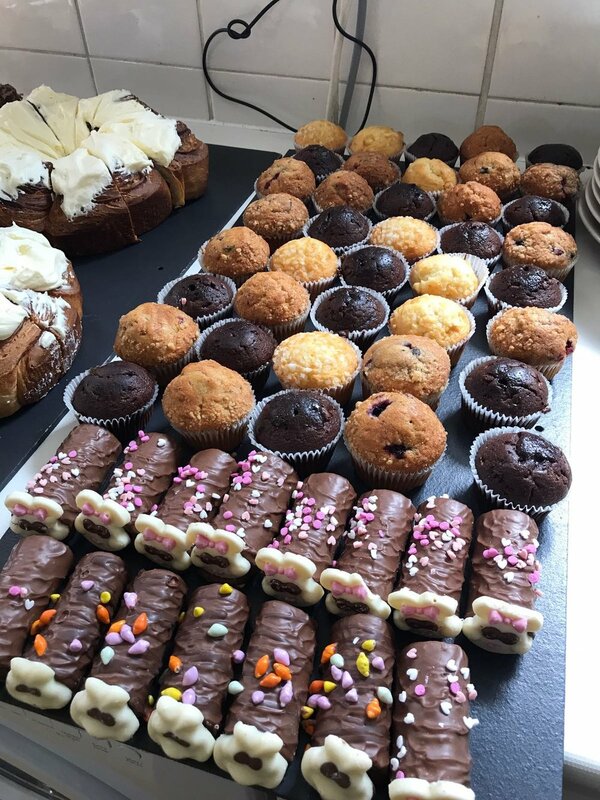 The children LOVED speaking to Jo and were so inspired themselves they want to run their own surplus pastries stall in the new year to raise funds for her upcoming crowdfunding campaign. A big thank you to Jo for taking the time to speak to us. Watch this space for more ‘Bubble & Squeak meets …’ guests in 2019. Exciting! Back in October, we were invited by OpenCell to exhibit our Bubble & Squeak project as part of their BioDesign: HereNow London Design Festival. OpenCell is a really innovative biology meet design meet technology space in Shepherds Bush Market, built using shipping containers (the best type of containers for startup spaces we think!). They are home to lots of really brilliant start-up companies doing amazing things with biotech. Such as Chip(s) Board, the eco-friendly alternative to chipboard and MDF made using potato waste. We had been down to the area a few times to visit our friends at Shepherds Bush / Market & Old Laundry Yard, as well as take part in the wonderful Studio Hache’s art workshops. The biggest question for us when doing our pop up exhibition for OpenCell was ‘what is BioDesign?’ and secondly ‘how does Bubble & Squeak fit into it?’. We like to see ourselves as innovators with our own startup kid’s run surplus food social enterprise. So we decided to exhibit our Bubble & Squeak story so far in our pop up container space for the week. It was amazing to pull all our work together and showcase the children’s amazing achievements since we started in February 2017. Secondly, we wanted to use this opportunity to use the language of food to engage our children with bio-design and all things science. So we reached out and pulled together two science workshops, which (to put it mildly) went down an absolute storm with the children. Mikkalia is an ex-chef turned teacher turned Chemistry PhD student at Imperial College. On the Family Day at OpenCell, we came down with the Bubble & Squeakers to get involved with her natural household product cleaning workshop using fruit and vegetables and a secret message writing challenge. Also on the day the children got creative with plastic with @studio.hache and did our very own treasure hunt with @ashleyscarborough. Thank you so much to OpenCell for the opportunity and to our scientists to bringing so much fun and learning for the children. We had a lot of fun doing this and would love more opportunities to bring the world of science + food together at Bubble & Squeak. Come to our next Brilliant Big Feast on Sunday 2 December run by the amazing FoodCycle East Acton with special help from our Bubble & Squeak mini volunteers. We had a great time at our last one with lots of local families coming to enjoy a delicious 3 free course meal using surplus food. This one will have a festive theme and family friendly activities. 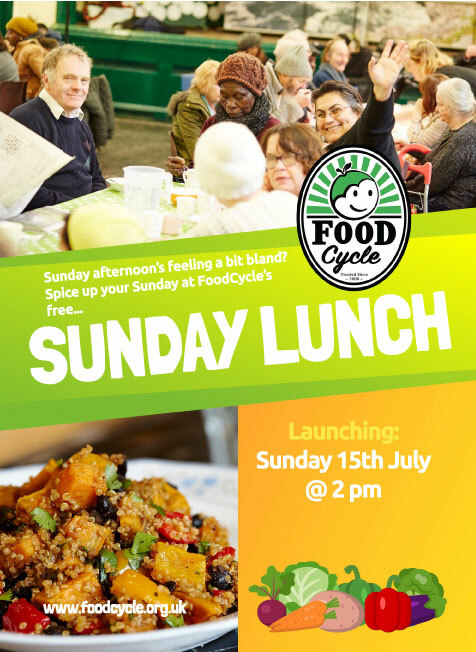 Remember Food Cycle East Acton also run their free community meal open to all every week at the Centre too. This week we we were delighted to get a 5 star food hygiene rating from Hammersmith & Fulham council, who came and inspected our shipping container. We take a lot of behind the scene care in the setting up and running of the stall and we are super proud to get this result. Its lovely to get recognition that at the heart of what we do, which is redistributing fresh and healthy surplus food to local families of Old Oak Primary School is done well and is established not only amongst our families but with the council as well. Also well done to FoodCycle East Acton for their 5 star result. As you may know, back in July we provided an innovative solution to the group by providing storage in our shipping container for their bits and pieces. They run a free 3 course community meal at Old Oak Community Centre every Sunday at 2pm using surplus food that would have gone to waste. Early in 2018 we asked local artist Joseph King (@JKingTheArtist) to create our Bubble & Squeak banner to go up outside our shipping container. 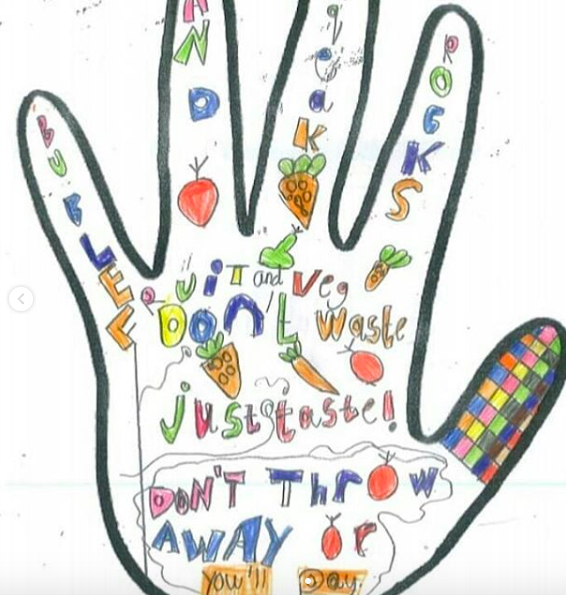 Running a series of workshops, the children designed their own food waste warrior messages drawn inside a hand to create a montage design. With thanks to @ArtsSocChiswick for funding this project! 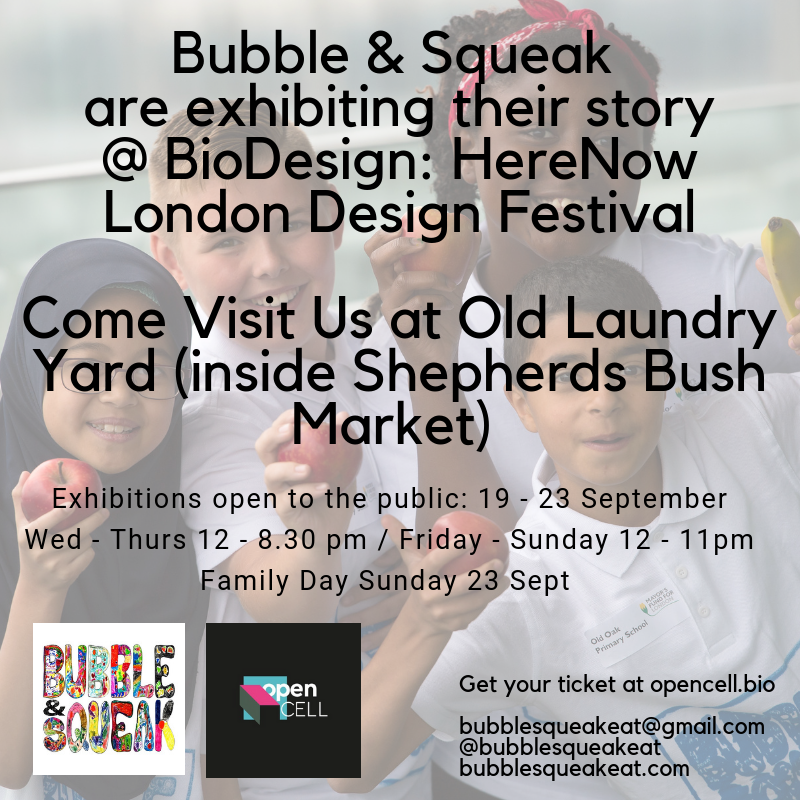 Launching this Wednesday 19 September, Bubble & Squeak will be popping up at OpenCell: Biodesign Here Now at Old Laundry Yard inside Shepherds Bush Market for the week. Invited by the innovative Open Cell, who are hosting a line of exhibitions, performance, workshops and talks by international artists and designers as part of London Design Festival 2018. Projects exhibited breaks the boundaries between biology, design and technology. We are super excited to be part of such an amazing showcase of talent and to promote Bubble & Squeak further in the wider community, opening our networks and scope of possibilities into the world of Bio design! Before we broke up for summer, the Bubble & Squeak crew were invited down by Keith from The Lilla Huset Professional Centre to pitch their surplus food social enterprise to his team. This is not the first time the children have been involved with public speaking, having won funds at Mayor For London's City Pitch 2017. Elly prepped the powerpoint slides, and the children rehearsed their lines all week with Lydia. We then jumped on the school bus to go to Lilla Huset's office in Hammersmith (thanks Bill for the lift!). The children then confidently gave an impressive public speaking performance - pitching for support from Lilla Huset to help us grow. Many thanks to Keith for organising us to come down. We look forward to developing further links with your organisation! On Wednesday 20th June Bubble & Squeak had a rather special intergenerational bingo event take place at Old Oak Primary School. Using the connecting platform Neighbourly Bubble & Squeak partnered up with their nearest Marks and Spencer store in White City, who came to help out at our last intergenerational bingo event of the school year! Between 18th - 22nd June, staff from every M&S store in the UK had the opportunity to volunteer for a project that will create a lasting benefit to a local charity or community organisation. A huge range of events was planned, from revamping community centres to hosting tea parties for service users, to visual merchandising of charity shops. We were lucky to be chosen by the White City Team who sent down ten volunteers to help out at the event. Everyone was amazing at pitching in to help out at the event, doing a lot of carrying, cutting, cleaning, serving and all-around amazing teamwork! The concept followed the same set up as our last event with the children working together with an older person to win a bingo prize. This time we had the generous prize donations from Marks & Spener team and anticipation was high! Thank you City Harvest for the amazing donation of surplus cakes. We had some amazing feedback from the older people who came to the event, from the prizes to the staff to the refreshments. A HUGE thank you again to Marks & Spencer White City store. Well! What a busy couple of months at Bubble & Squeak HQ it has been with our move to our shipping container space at Old Oak Primary School. It has been brilliant to get settled in and have proper storage to run our Monday surplus food stall from. As always the children still set up the stall and sell the surplus produce from their pop up food stalls. The container was funded out of our successful crowdfunding campaign we held last year and we were lucky enough to be put in touch with a local resident who had a second-hand container we could take for free! Fitting in perfectly with our environmental ethos it was great to put back into use the unit. Bill the site manager of the school was fundamental in managing the project. Organising the removal from Acton to Old Oak Primary School, working out if it would fit into a very narrow space (with quite literally inches to spare), organising contractors to install the gates and hooking us up to the electrics. THANK YOU BILL! For our banner to go on the shipping container, we worked with local artist and Old Oak friend Jo to run a series of workshops with children in Old Oak Primary. Each child designed their own Bubble & Squeak hand, with their usual flare for creative phrasing. So far the move from the playground to the side of the school has gone well and we have noticed more parents coming round as the weeks go on. We look forward to developing the space further and have some exciting news coming soon for a new partnership opportunity coming to Old Oak, making further good use of your crowdfunding pledges. The container from the side squeezed into its new home at Old Oak Primary School! We are very excited to have our next intergenerational bingo event lined up, taking place this Wednesday 20 June 2018. For this one we have teamed up with Marks & Spencer for their ‘Making Every Moment Special’ campaign. For a week in June M&S will be donating volunteer time and skills to causes in each of their local communities. We will have Marks & Spencer volunteers from the White City store who have generously signed up their time to help out on the day! Local grandparents and non grandparents alike local to Old Oak are warmly invited to come along and play bingo with the help of your grandchild or an Old Oak Primary School child. To book your place please ring Lydia on 020 8743 7629 at Old Oak Primary School. With bingo prizes, surplus food refreshments (generously donated by our surplus food partners) and lots of Bubble & Squeak helpers hosting on the day we can't wait! 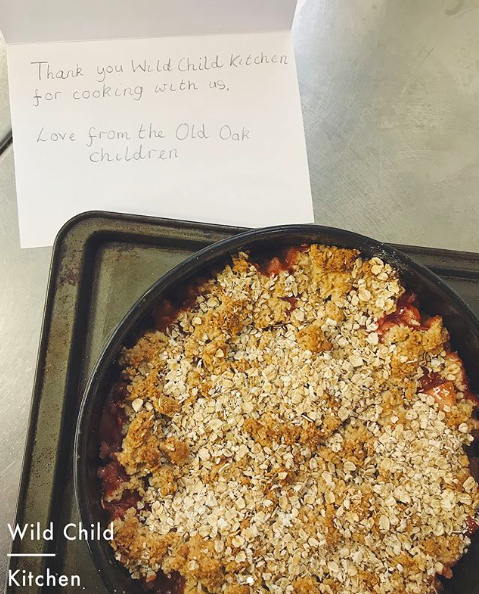 On the last day of the school holidays, Bubble & Squeak were delighted to host the amazing Wild Child Kitchen at Old Oak Centre's Holiday Club! Wild Child Kitchen are London's new healthful food service for children and mission is to inspire the next generation of little foodies with a menu of colourful dishes influenced by cuisines from around the world. Natasha and Lu cooked with 24 little foodies cooked up delicious Apple & Plum Crumbles free from refined sugars (but just as delicious). The children had a fantastic time and they loved making and eating their crumbles. Wild Child Kitchen reached out to us after our mention in February in Time Out. They loved we are addressing food waste and encouraging entrepreneurship amongst the school community. Here at Bubble & Squeak, we think it is so fantastic such inspiring businesses want to take the time be part of what we are doing and believe in our mission of being the change we want to see in the world! It is equally great that Bubble & Squeak can be a platform to connect our community with such great organisations and businesses. A Big Thank You To The Wild Child Kitchen Team! "Pupils who have roles in the school's 'Bubble and Squeak' food waste project are impressive and mature ambassadors for the school. They are making a difference to their world through their actions".